Though Roy's Hawaiian "Fusion" (shudder) has its share of ardent fans, I am not one of them. So when I saw one of Roy's protegees had opened a restaurant serving "continental social food" I was pretty skeptical. Already dubious, when I saw the "Omakase" option on the menu I almost dismissed TAG out of hand, thinking they were just trying to play off use the term to build mystique. 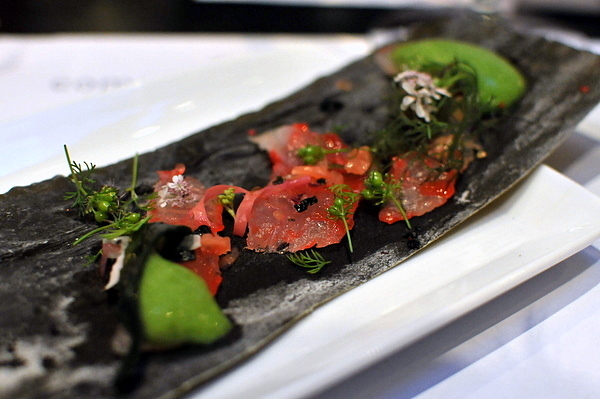 When I called the restaurant I was pleased to learn the omakase was indeed a spontaneous menu created by the chef which should almost certainly be better than the typical staid Asian fusion fare . After I arrived at the restaurant I was further heartened to learn that various chefs are each responsible for a single course on the menu and they use the opportunity to compete. 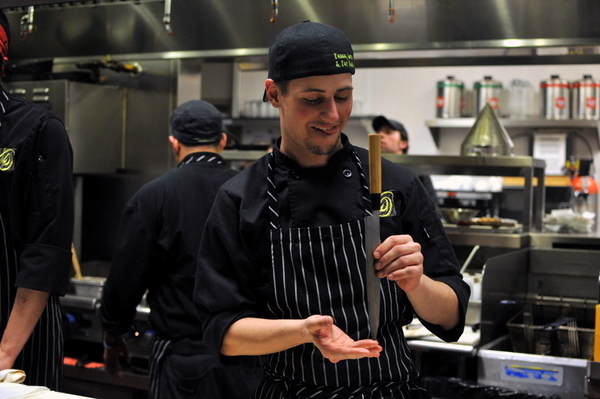 TAG opened in 2009 by Chef Toy Atherton Guard and his wife Leigh Sullivan-Guard with a focus on creating playful dishes using fresh local ingredients in a sharable interactive atmosphere. As expected, the food draws heavily from Chef Guard's Hawaiian upbringing as well as his travels through Asia and Latin America. The first course made by TAG's sushi chef "Crunchy" who got the nickname by setting his fro on fire with a chef's blowtorch. Though the menu only lists the lobster, there were two actually cups one beef and one lobster. The lobster had a nice rare crunch and the shellfish's sweetness was deepened with the earthy musk of fresh shiitakes. The other cup came with fatty Wagyu/Angus tataki topped with sweet teriyaki and briny tobiko. 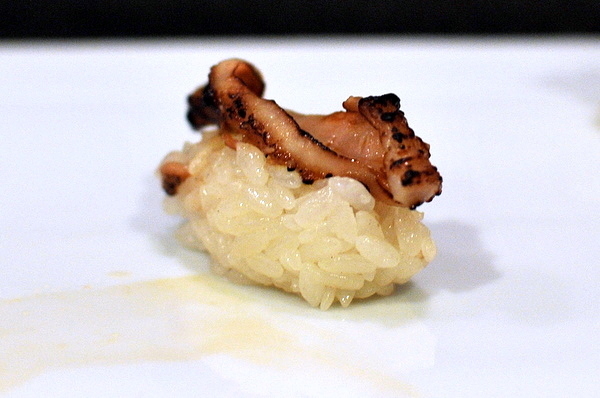 Of the three menu items included in the omakase the Hiramasa was the only one I would have ordered on my own. The fish is seasoned with a combination of white truffle oil and soy then flash seared with hot grape seed oil a la Nobu's New Style Sashimi. Chef Guard's version holds its own, the dish fittingly centers around the elegantly textured Hiramasa, and layers on a set of different but harmonious flavors. Though the pop rocks seem like a gimmick but their crackling sweetness adds a nice contrast to the heady oils and fresh vegetal micro greens. 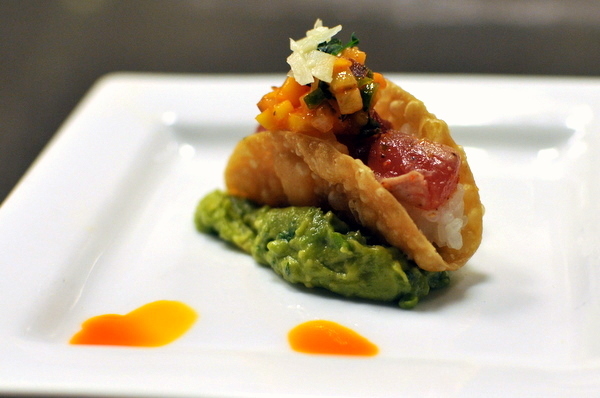 Another regular menu item, the taco consists of sushi rice, ahi, toragashi, mango salsa, chili oil and guacamole. 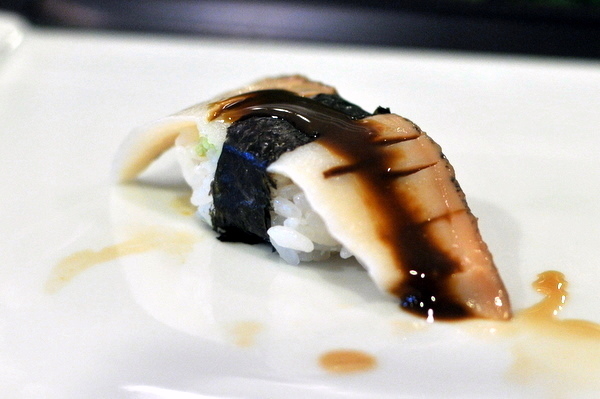 Where to begin with this one a sushi taco just screams insipid Americanized drivel. Despite its origins, this was still an enjoyable enough course, particularly the interplay between the sweet mango and spicy chili oil though I think a bit more savoriness would have made the dish even better. 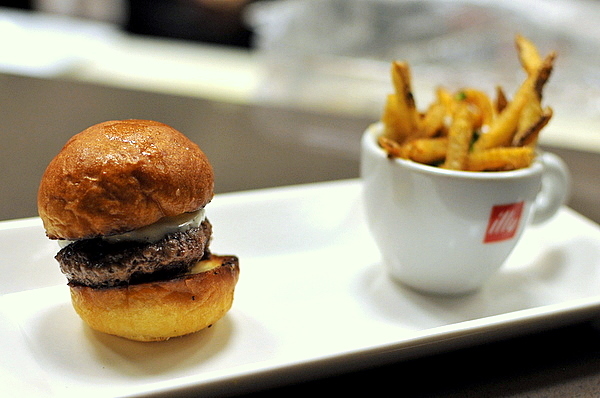 Far and away, the sliders were the most ordered dish of the night; I watched the little suckers fly out of the kitchen like they were free. The meat was juicy and flavorful while the blue cheese aioli added a pleasant piquant tang the only knock on the burger was the slightly dry bun. The accompanying fries were seasoned with a combination of pepper and sugar that was initially disconcerting but grew on me over time. Delicious but not distinctive, I found the sliders somewhat passé, though given their popularity their inclusion in the omakase is understandable. Prepared by Jensen's brother Mitchell, the scallop was a very very close second for best course of the night. The scallop was well cooked, thick enough to have some firmness and char on the exterior while remaining rare on the interior. 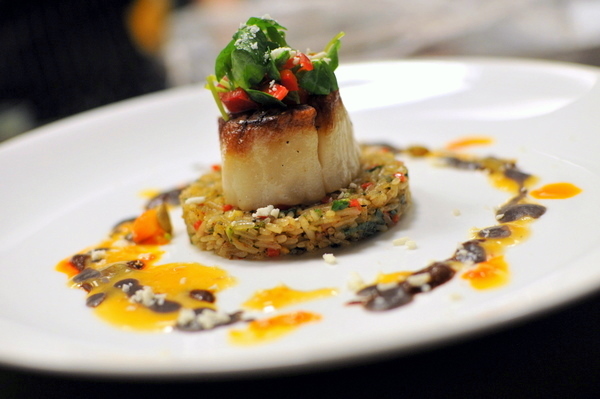 The rest of the dish draws heavily on Latin influences, juxtaposing the brine of the scallop and vegetal pea shoots with a smoky spicy blend of Mexican-style fried rice, black bean puree, and TAG mole. Though this was billed as a "yakitori" inspired course I couldn't really see it. 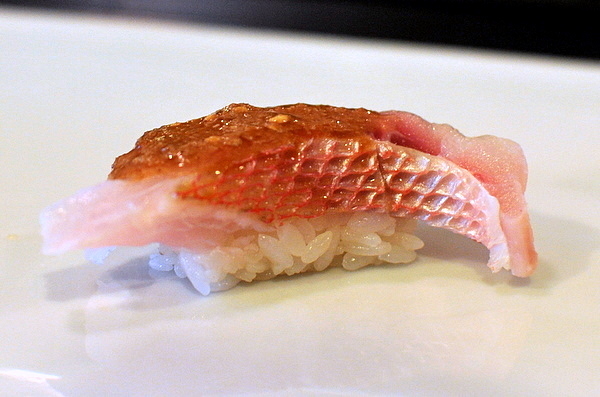 The exterior shell of the fish has a sticky sweet char while the interior is milder and tender. I feared the combination of Kabocha squash and grilled apples would be overly sweet but they were balanced by a strong heat in the sauce and jalapeno slices. 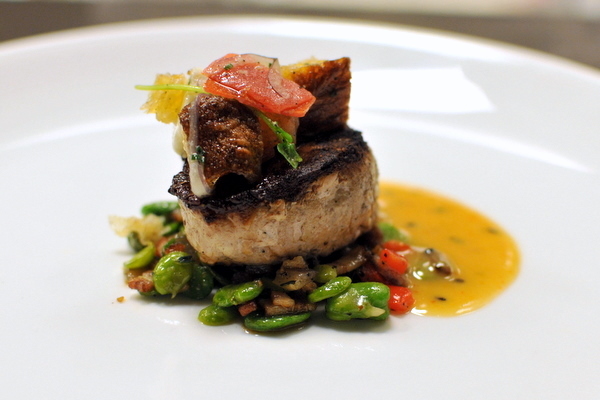 Jensen was also responsible for this course, a pork loin that was smoked in a block of ice then grilled. Despite looking quite dry the meat was actually quite soft and juicy. 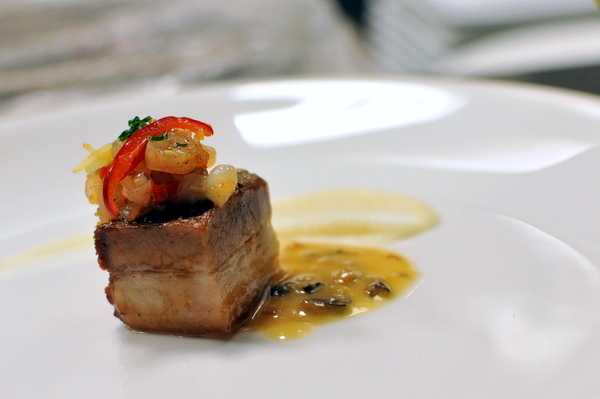 The deep woody essence of the pork is complimented by an inventive gojujang butter with its darkly fermented spice. 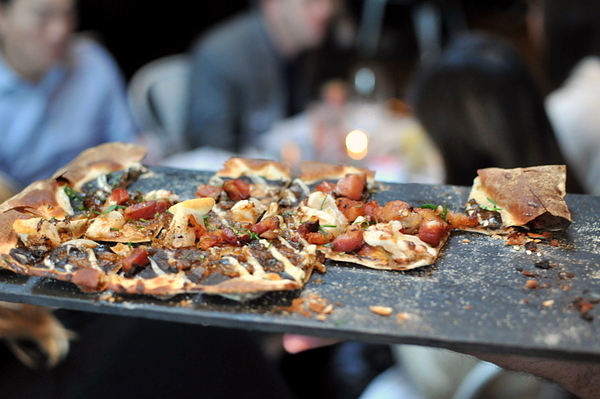 To temper such aggressive flavors Jensen uses a rustic blend of shiitakes and favas as well as a topping of buffalo mozzarella and confit tomatoes. 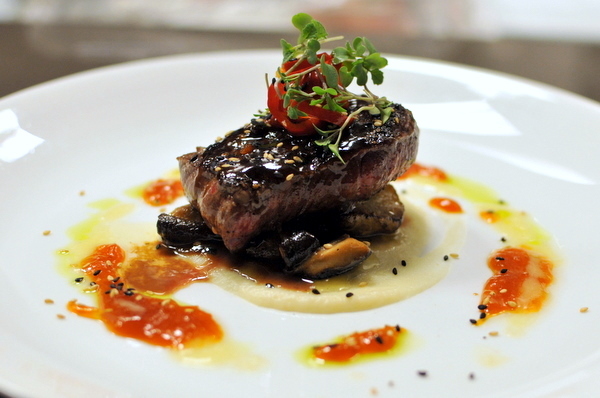 No tasting menu in Denver would be complete without a bison course and this is a bold one. The rich iron tang of the meat is coated in a spicy sweet BBQ sauce and finished with yet another round of microgreens and chili slices. 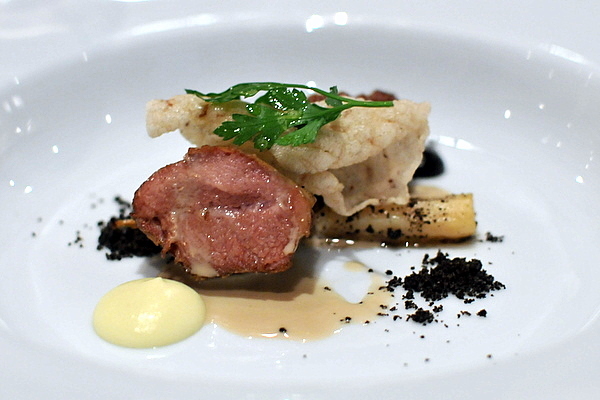 Despite its weight, the animated flavor of the meat made this a very enjoyable course. 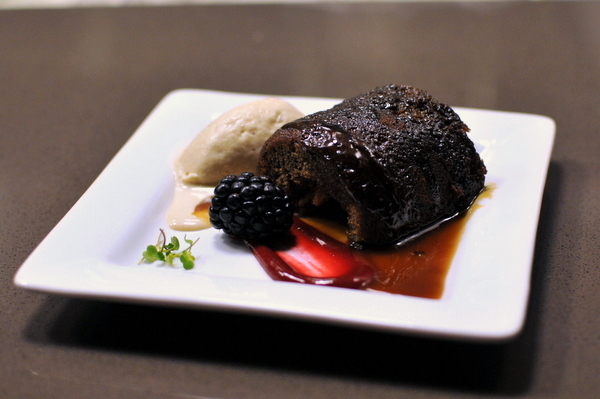 A surprisingly heavy dessert to start, the cake itself was reminiscent of a bran muffin saturated with a palpable sweetness. I interaction with the burnt sugar ice cream which helped to moderate the gravity of the cake. 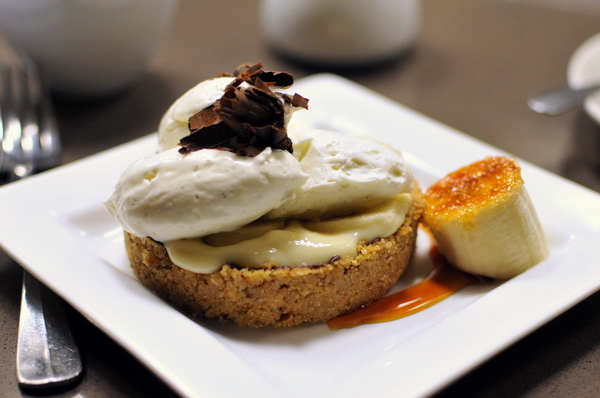 The second dessert was the restaurant's take on a banana cream pie, fairly typical but for the pistachio crust which adds a much needed savory note to counterbalance the monolithic mellow sweetness of the cream. 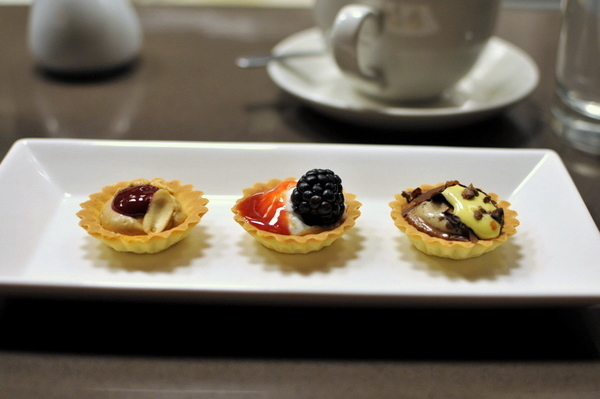 The meal ended whit a trio of tartlets: peanut butter with milk chocolate, chantilly cream with blackberry and blood orange jam, and mocha espresso with pastry cream and champagne sabayon. Throughout the meal I was given a front row seat for the antic's of TAG's team of chefs, and this was definitely one of the most spirited crews I've ever seen. 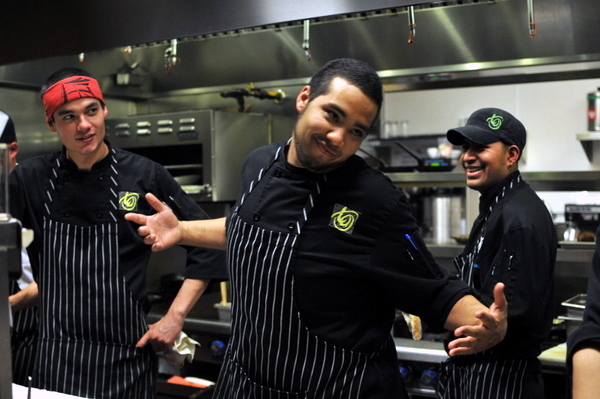 Perhaps Chef Guard being on vacation had something to do with the relaxed atmosphere, but all the stereotypes of a kitchen being a boys club replete with frat-house pranks were true at TAG. To be fair, the restaurant was packed and the kitchen still managed to handle the rush so it didn't seem the chefs let the horseplay get in the way of their work. At the end of the night I was bursting full, and though the chefs were impressed with my 12 course menu, they mentioned the record was 16. The omakase is a fun way to sample what TAG has to offer though it feels extremely overpriced with course costing $12.50 (even the petit fours). 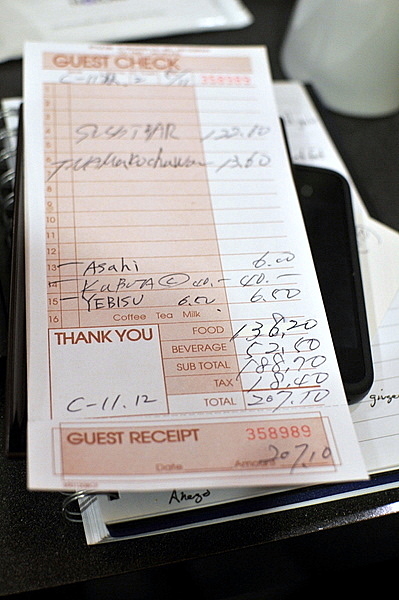 At the time I didn't realize just how badly they were gouging me, but the fact that I could have ordered full portions of the three on-menu items (sliders, taco sushi, and hiramasa) for less than they charged for the omakase left a bad taste in my mouth. 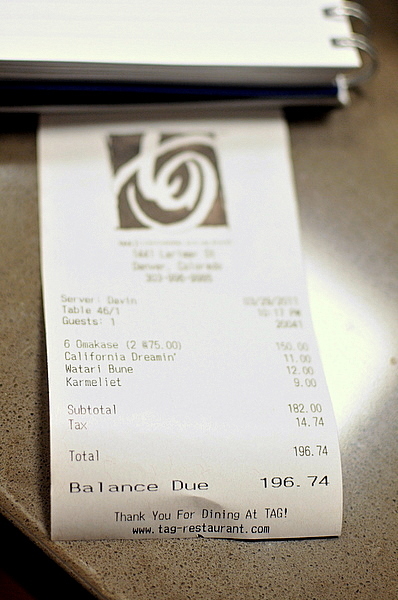 Though in all fairness to TAG, I paid the same price for much much less at Opus less than two weeks before. 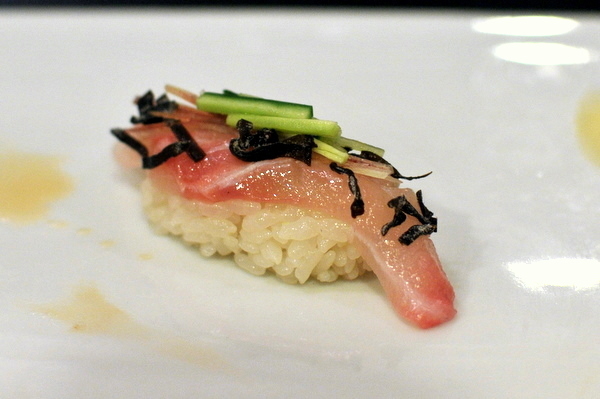 Price aside, I was very impressed with TAG, yes there were a few uninspired courses, but the spontaneous parts of the omakase showed a level of creativity and talent that made this one of my better experiences in Denver. 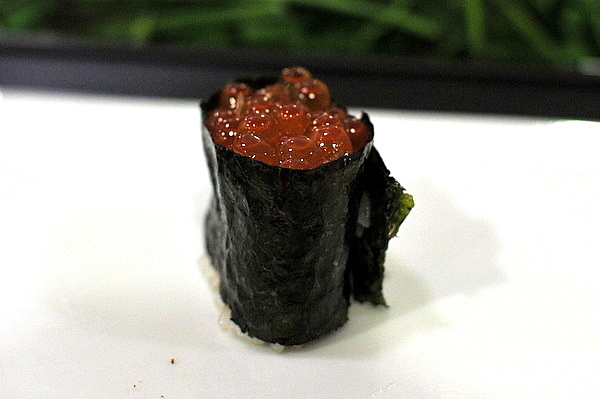 My first trip to Nozomi was over a year ago and I was thoroughly impressed by the omakase. 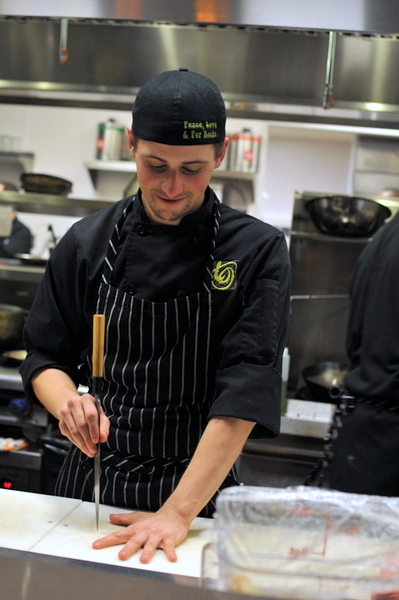 The restaurant offers an array of cooked dishes as well as the typical rolls, but I'd recommend getting a seat at the bar and trusting the chefs. 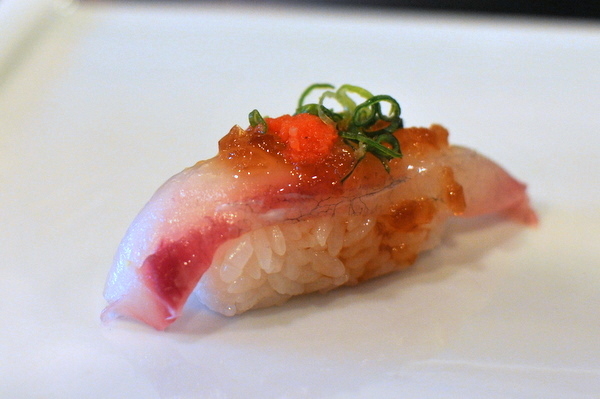 The nigiri compares favorably to more renowned spots in LA yet Nozomi manages to retain the feel of a neighborhood sushi joint. The head chef, Yasu, has an air of humility and a warm sense of humor, quite the contrast from the stern unsmiling itamaes behind some other sushi counters. The meal started with a light salad of cucumber and seaweed meant to whet the appetite. 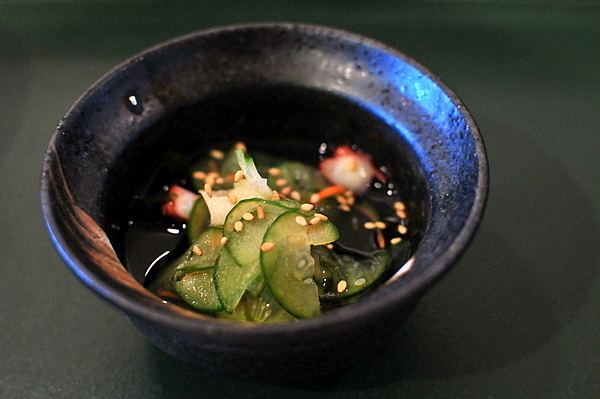 The crisp vegetables are paired with a dense meaty octopus, a simple yet effective amuse. Though a favorite cooked fish of mine, I don't recall ever seeing grouper at a sushi restaurant. 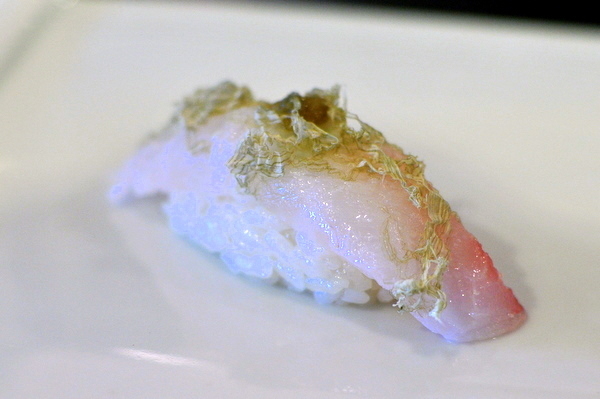 The fish is uniquely dense, snappy, and fibrous while the "melty" leeks and yuzu kocho provide an earthy citric accompaniment. 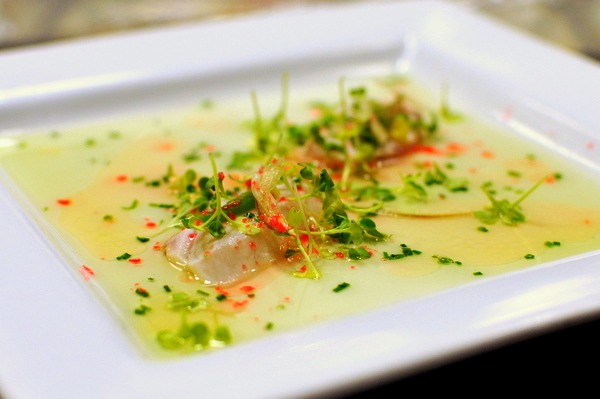 Black snapper has never failed to impress, the texture and flavor are both much fuller and fattier than other snappers while the topping of daikon and scallions adds a lovely contrasting tang. Aji is an old favorite that never fails to please, just seeing that translucent pink flesh and shimmery silver skin can set me drooling. 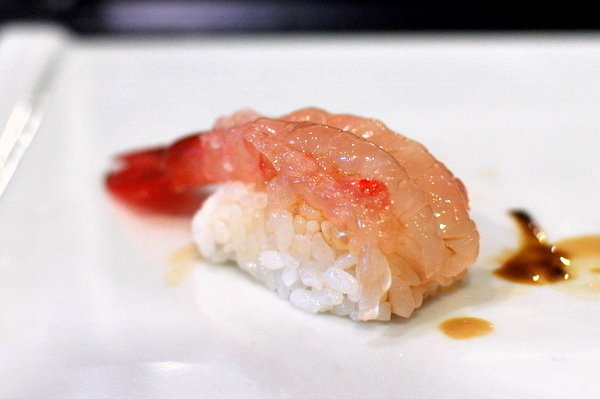 Nozomi doesn't break any new ground here, offering a jellied oil laden fish laced with the spicy bite of ginger. Needlefish often comes rolled or folded very artfully though I'm not sure what purpose that it serves. 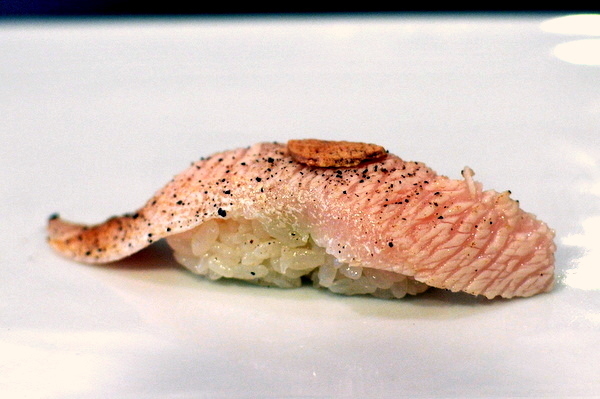 Regardless the fish leans toward the milder side, though the dried miso accentuated the fish's natural flavor. 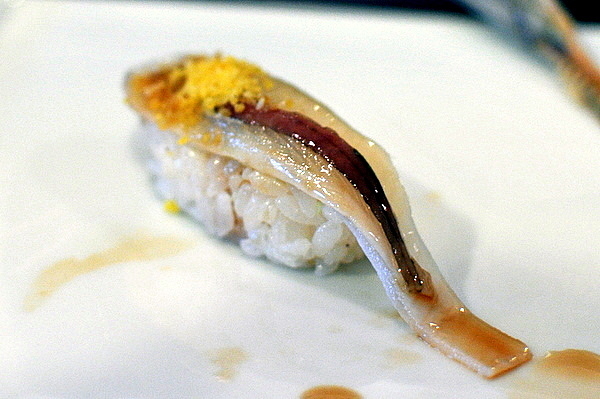 Kohada has always been one of the most eye catching fishes around, with an unabashedly oily flavor that is just as arresting. As a bonus the sushi came with a deep fried chip made from the fish's bones. 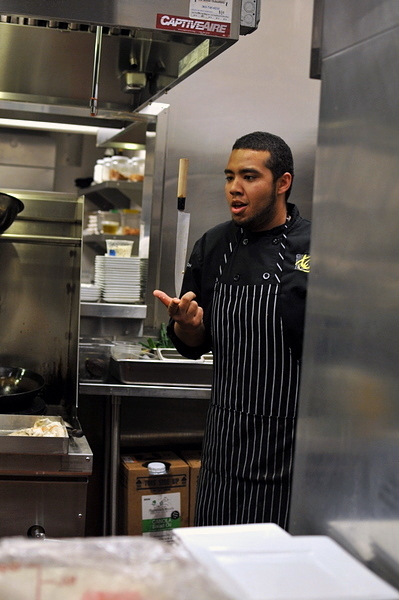 Mark, mentioned the abalone was a special that came from a regular who free dives for them off the coast of Monterey. Despite being scored, the generous slab of abalone was exceedingly muscular requiring significant effort to chew through. The brown sauce is a blend of soy and the abalone's innards, its offal-tinged earthiness was quite a change from the delicate brine of the mollusk itself. Hard not to love fresh amaebi, the plump shrimp has a lush juicy crunch and the flavor is a combination of sweet shellfish and chilling metallic brine. 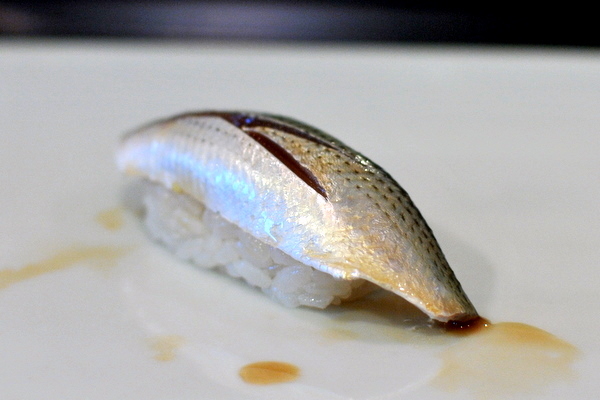 The fish has a slick snappiness as well as a nuanced oiliness that is much more expressive than the more common white fish varieties, little wonder that this has become one of my favorite sushi. From the appearance to the amused glances the chef and owner were exchanging, everything about this course reminded me of shirako. Turns out this was actually the egg from a female opal eye and though the flavor was reminiscent of shirako the texture was markedly grittier. 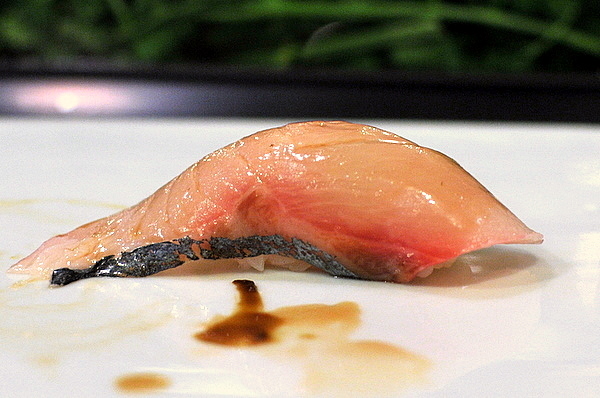 A very unique presentation of yellowtail belly, the fish retains an immensely soft texture while the grilling adds a savory aroma of charred fish oil enhanced by the pepper and garlic chip. Though this particular piece lacked any overt marbling it proved to be a very good piece of toro, silky smooth and clean of any gristle with a palpable richness that left me wanting more. 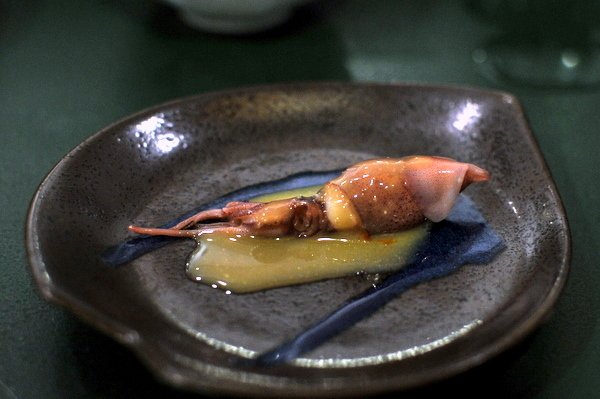 Another rarity that until now has been an Urasawa exclusive, the squid is delightfully snappy while its earthy brine is tempered by the application of a sweet white miso. Dried sea cucumber is a delicacy in Chinese cuisine so I was curious to see the Japanese take on the fresh version. Truth be told I couldn't discern too much difference between the two, both are fairly mild with this being perhaps a hair firmer. Still the egg custard was quite enjoyable, infused with a delicate brine from both the shrimp and sea cucumber as well as an herbaceous counterpoint from the cilantro. Though it took me some time I've come to enjoy fresh Ikura immensely; the tiny globules snap and pop releasing a cascade of perfectly chilled brine. Yet another new experience for me. The opal eye's flesh is decidedly lean while the slivers of cucumber and myoga added a refreshing edge to the otherwise mild fish. 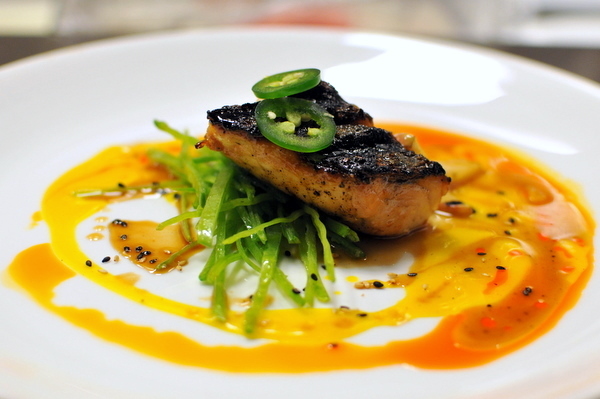 Regular tuna tends to be a bit boring but the Zuke manages to hold its own with a savory depth from the marinade. 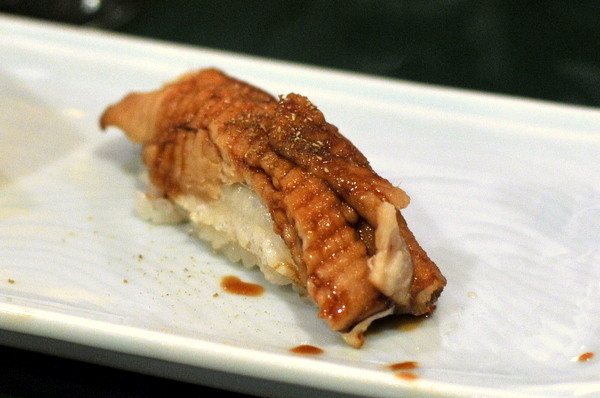 I've slowly managed to shed my preference for unagi in favor of the more refined anago. 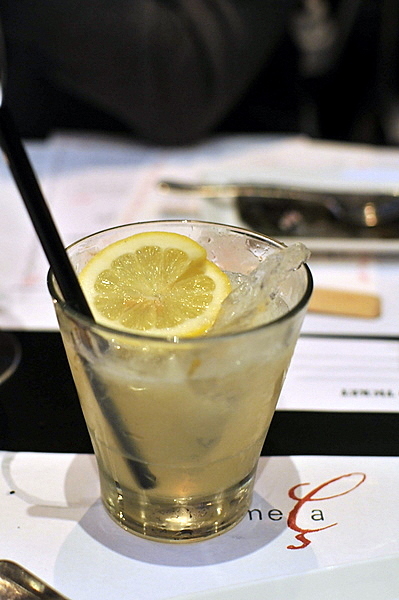 This was a particularly effective preparation, with the dusting of sansho pepper adding a pleasing numbing tingle. 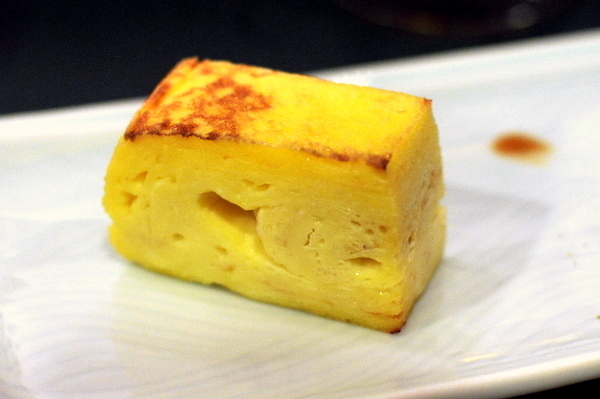 Tamago is the traditional close to a sushi meal and though I wasn't a fan at first the sticky savory sweetness is a nice change of pace from the savoriness of the nigiri. 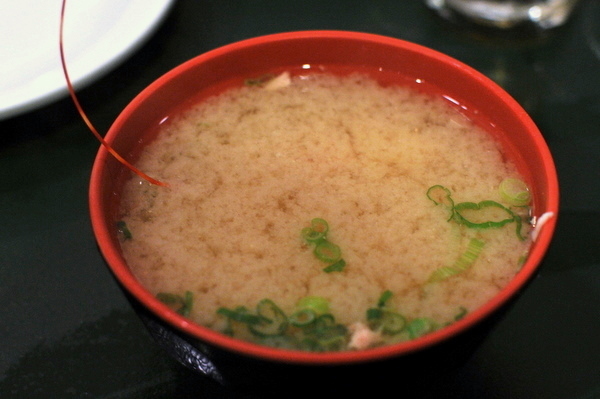 Rather than fry the heads, the kitchen used them to flavor a bowl of miso soup to finish the meal. Though the richness of the shrimp was evident, I would have preferred the visceral crunch of biting the freshly fried head instead. 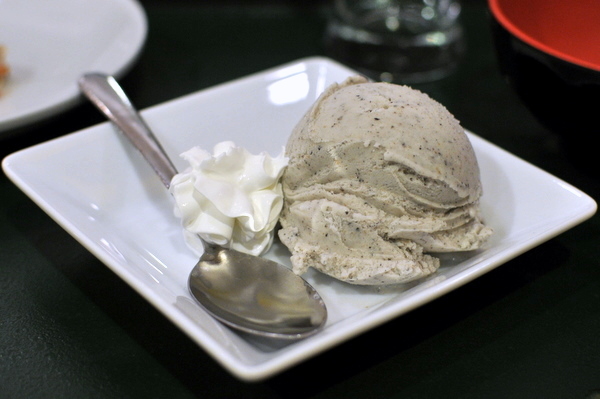 I've developed quite the penchant for sesame ice cream, whether its the sublime homemade version at Urasawa or a simple store bought variant like the one above. 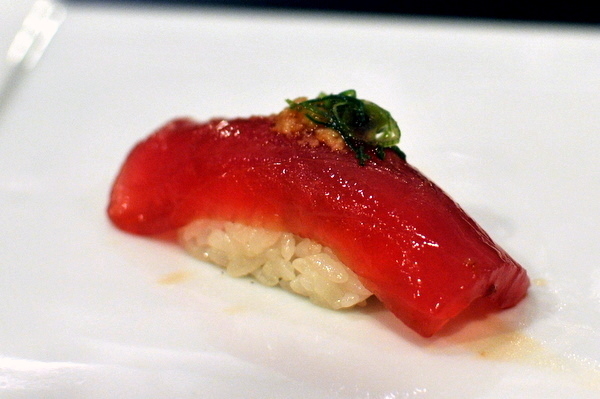 While decor might leave something to be desired, the quality and variety of the fish reaffirm Nozomi's place as one of the top sushi restaurants in Southern California. 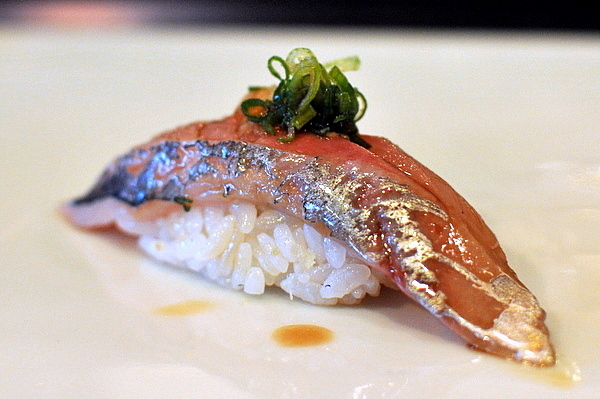 The food falls slightly short of Mori or Zo with the main differentiator being the quality of the rice. 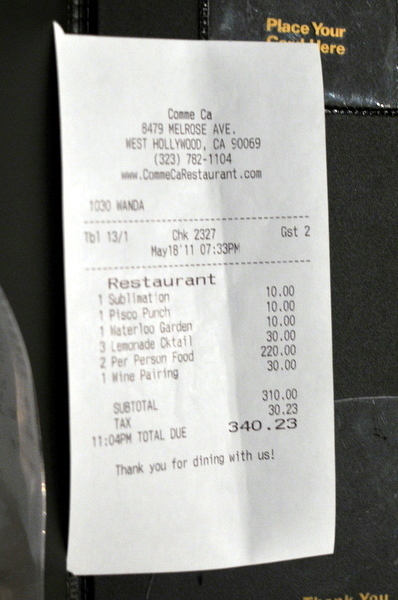 Still at less than $70 per person for 20+ pieces of sushi, Nozomi is quite a bargain compared to its peers. Completely unpretentious, Nozomi caters to all types; there is no "Trust Me" rule here, still if you choose to do so you will be richly rewarded. The Ibaraki Benefit dinner at Breadbar was nothing short of stellar, with six of LA's most accomplished chefs each turning in a performance demonstrating exactly why they are held in such high regard. The event was organized by Noriyuki Sugie, a native of the stricken Ibaraki Prefecture in Japan. 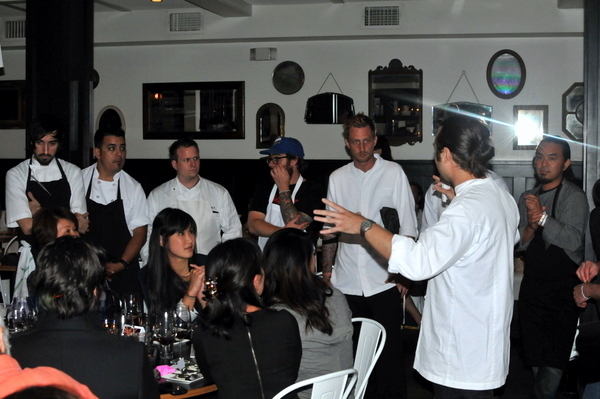 David Myers, who participated in the first dinner, opted to host a second event at his restaurant Comme Ca featuring many of LA's younger star chefs. With a lineup including Michael Voltaggio, Roy Choi, Jordan Kahn, Jon Shook, and Vinny Dotolo, I fully expect the food to be more avant-garde and even a bit anti-establishment this time around. 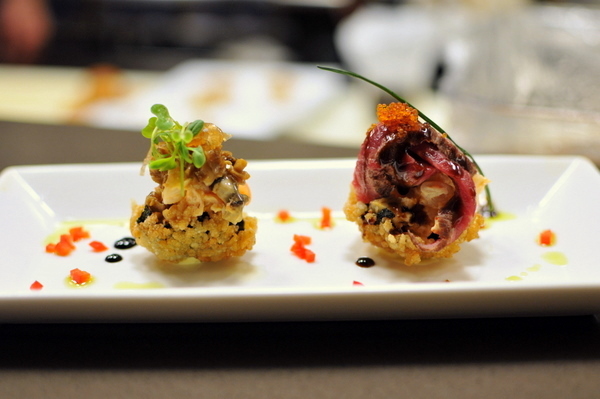 The meal started off with a cocktail reception and endless platters of small bites by Chef Kuniko Yagi. Among the snacks were delicious izakaya-style shrimp balls with nori, a tarte flambé, pork belly wrapped in shiso, and a beef tartare (not pictured). 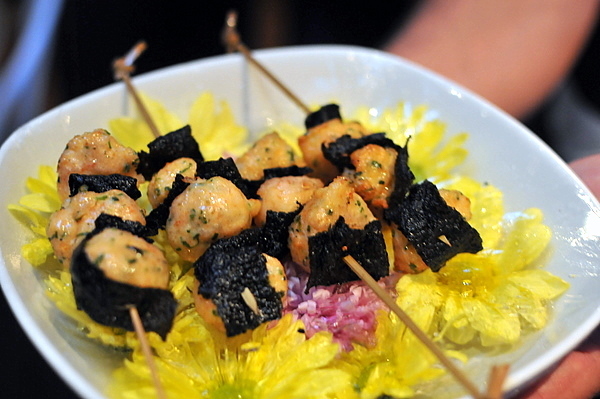 Many of the dishes had a distinctly Japanese feel and after the meal Kuniko mentioned she particularly enjoyed making the canapes as she so rarely gets to cook this style of food. 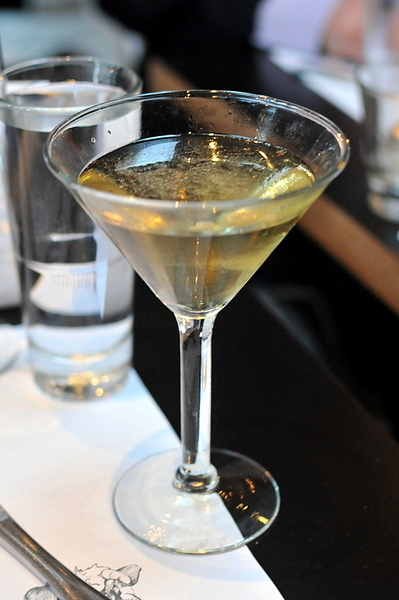 Pisco generally makes for an easy drinking cocktail, and the generous application of fruit gave the drink a flavor reminiscent of tropical sweet tarts while the vanilla bean and anise added a savory creamy essence. This was the hardest cocktail of the night with a distinctly medicinal profile, but despite being made up entirely of alcohol the golden elixir went down smooth almost like a hard ginger ale. 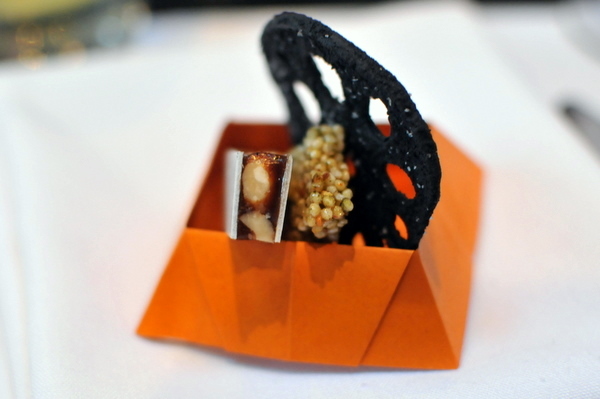 In addition to the canapes, Chef Yagi presented each diner with a trio of snacks in an origami container that she created. The miso peanuts in rice paper was probably the most distinctive, though I found the deeply earthy flavor a bit overwhelming. The lotus root was reminiscent of a potato chip with a straighforward saltiness that proved quite addictive. Still my favorite was the cracker of puffed grain, the flavor alternating between Japanese rice cracker and buttered popcorn. I'll take a whole bowl please and some beer. 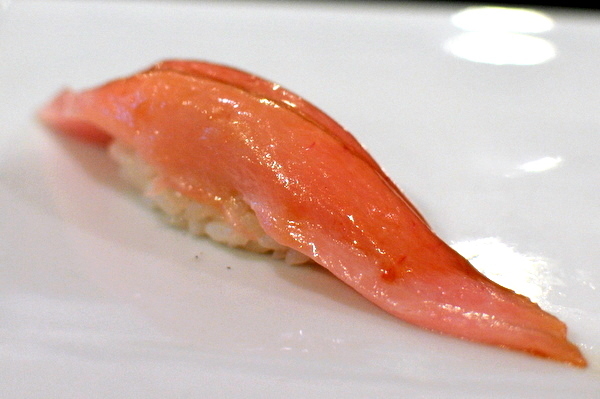 Fluke tends to be a very clean and mild fish, the pink translucent flesh absorbed the bitter earthy brine of the kelp. I quite enjoyed the dish despite its markedly floral astringency; the forcefulness of the kelp keeping the attention on the fish. This was definitely a step up from a Mike's Hard Lemonade. 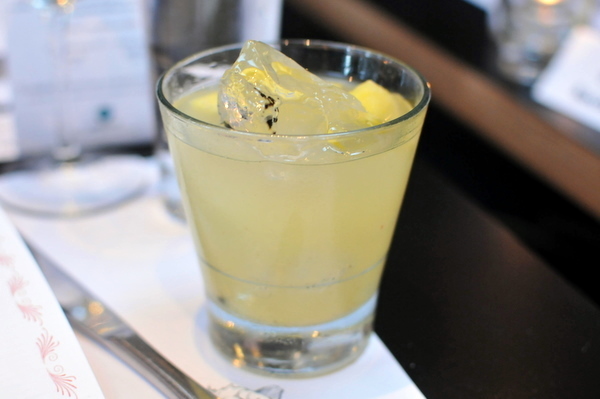 The medicinal woody tequila is tempered by the lively sweet sour tang of the Combier, fruit, and honey. 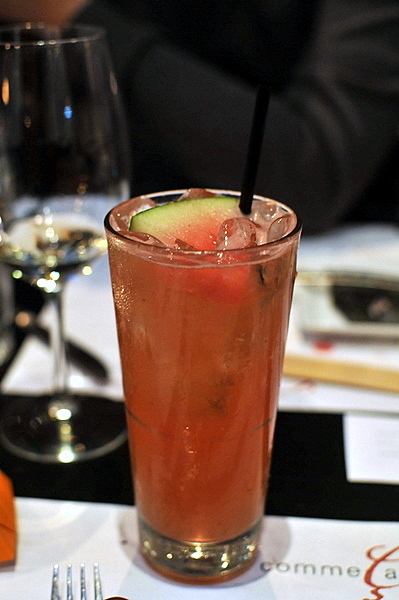 This was probably my favorite cocktail of the night, the lush sweetness of the watermelon gives way to an herbaceous Cynar-like bitterness on the finish. 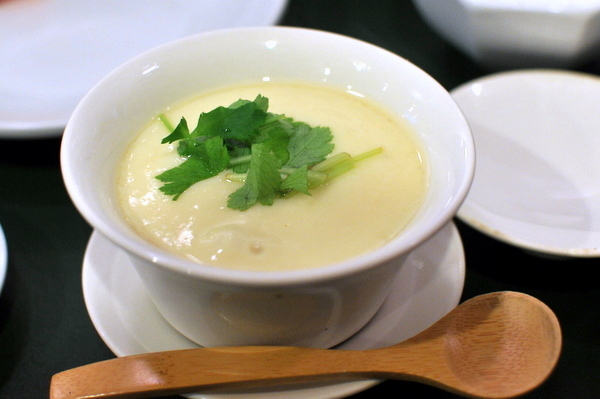 Though the soup is described as a deconstructed Caesar salad, the flavor is more like a Chinese "Gaotang" because of its umami-tinged hammy flavor profile. The aged lard had a flavor remiscent of lap chong while the bread developed a malty sweetness in conjunction with the soup. 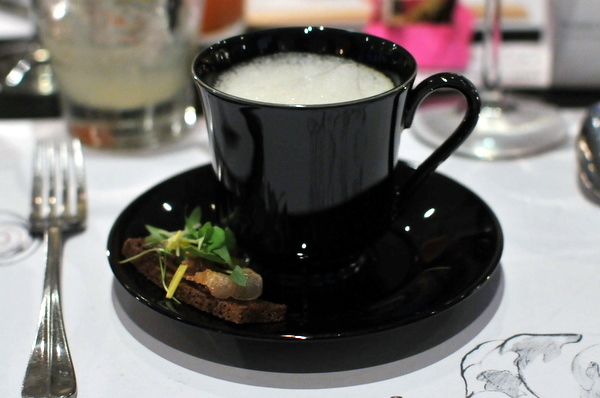 Chef Sugie might have cheated a bit rehashing a soup he made at Sashi and part of his amuse from Monday, but when it works this well who really cares. 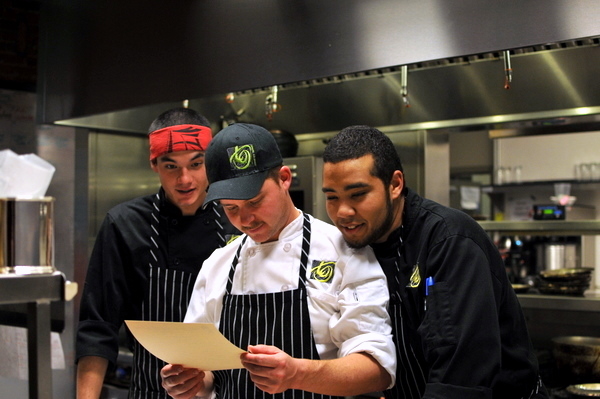 This course was heavily based on one from the Two Dudes' new restaurant Son of a Gun. 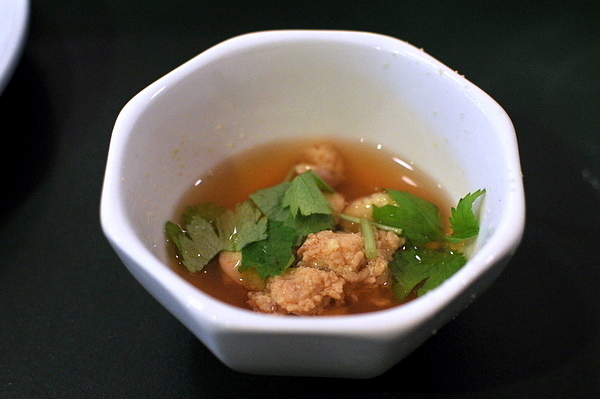 Imagine an immaculately steamed piece of fish sitting in a bowl of pho composed of the freshest ingredients. 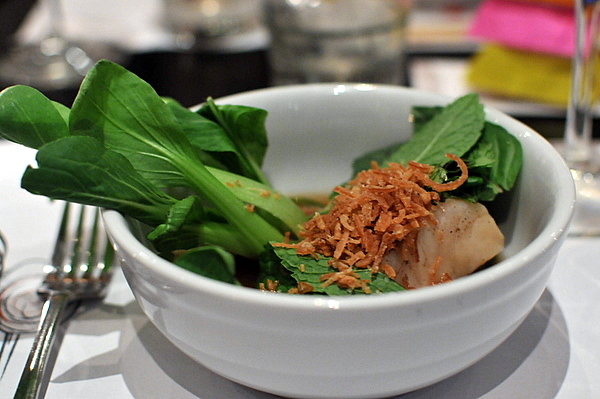 The soothing hearty flavor of the pho is absorbed by the flaky succulent white fish while the raw vegetables add contrast and verve. A unique take on a classic comfort food, a bit lighter on the cinnamon and it would have been perfect. 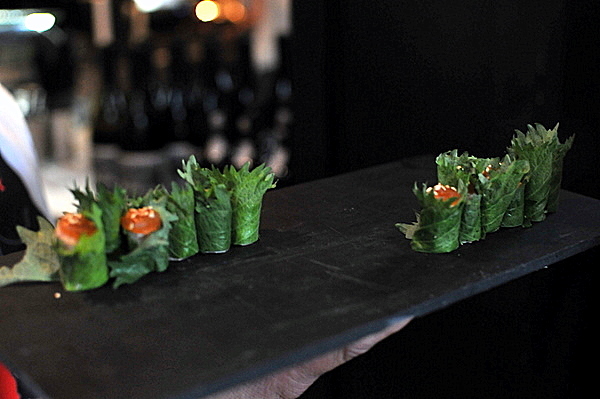 The chefs all managed to stay quite faithful to their styles and for Chef Choi that means "Modern Picnic." This course was a small preview of the food he serves at A Frame, a chicken stuffed with a beer can then roasted to crispy skinned perfection. 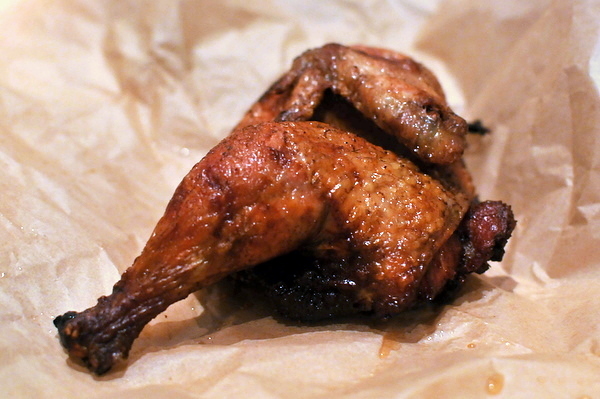 The flavor was fairly typical but the bird had a distinctive moistness that I appreciated. 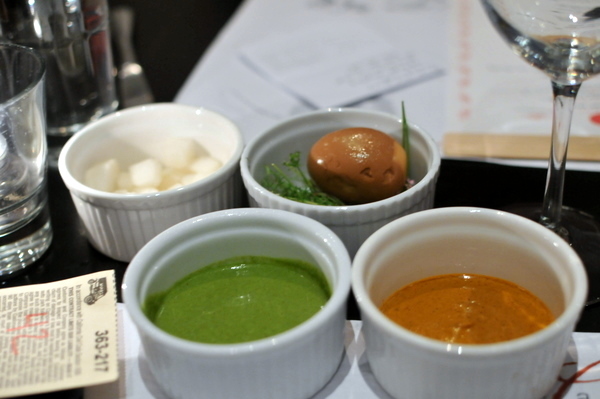 The two dipping sauces were both delicious with the roja being a touch earthier and spicier and the verde having a bit more acidity. The kimchi was a pleasant diversion between bites of greasy chicken. Though I enjoyed the egg, it felt somewhat out of place with the rest of the food. I was initially ambivalent about his choice as I often find veal dry and utterly without flavor. Chef, I'm sorry I doubted you. The veal cheeks were the most tender I've ever had and infused with a concentrated sapor this can only be described as the ideal veal. Both the wickedly salty anchovy-potato and bitter parsley root paired nicely but it was the lemon ash with its graham cracker like sweetness that caught my attention both for its unique flavor and for how well it paired with the veal. 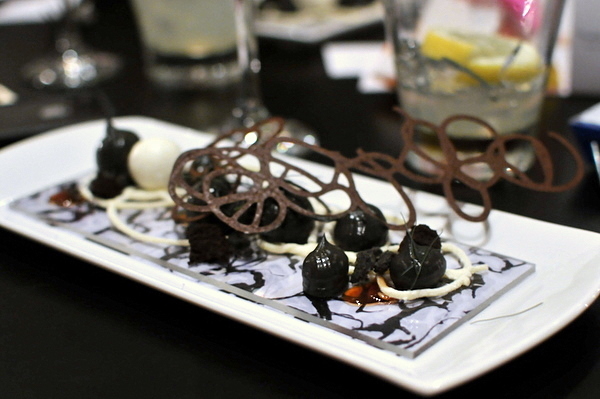 Inspired by the artwork that it shares a name with the dessert looked like a chaotic jumble but came together beautifully on the palate. The two dominant flavors, black sesame and white chocolate reminded me his famous White Chocolate Cube. But it wouldn't be a Jordan Kahn dessert without a few twists, this time in the form of a savory counterpoint courtesy of a black malt cracker. Though I would have liked to see some of Kahn's savory courses, his desserts are always a treat and consistently the best in the city. The second Ibaraki dinner lived up to my expectations, though with such a strong lineup of chefs I shouldn't have expected anything less. 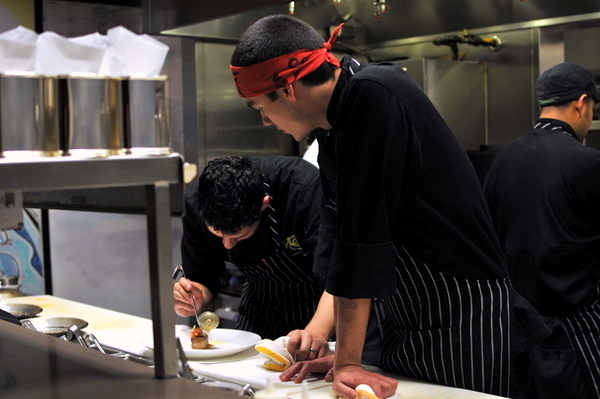 For the most part, the chefs played to their strengths and doing so for a worthy caused seemed to bring out the best in them.